For most engineering majors, numerical methods is a required portion of the math part of the examination. 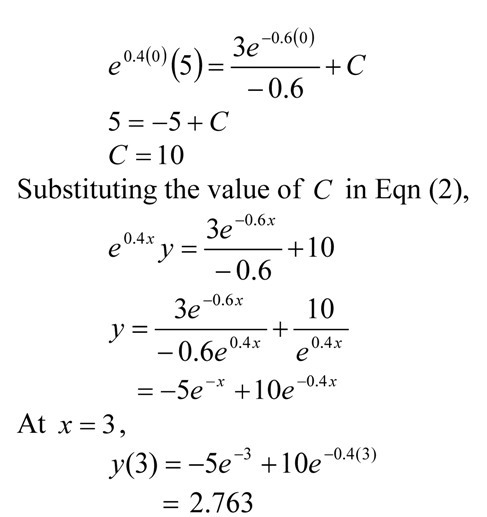 Here is an example of using Euler’s method to numerically solve an ordinary differential equation. I have a audiovisual digital lecture on YouTube that shows the use of Euler’s method to solve a first order ordinary differential equation (ODE). To show the accuracy of Euler’s method, I compare the approximate answer to the exact answer. A YouTube viewer asked me: How did I get the exact answer? In this blog, I use the integrating factor method to find the exact answer, because that is the method the viewer was using to solve the ODE exactly. So here it is and in two future blogs, I will show the same example being solved by 1) Laplace transforms and 2) the classical (complementary + particular) solution techniques. The pdf file of the solution is also available.